Feel some of your muscles contract and find out what parts of your body they move. Try a series of activities to feel your muscles contract and find out what parts of your body they move. Muscles can only contract (not extend), so they work in pairs to move limbs in opposing directions. Remove any baggy material, to feel the muscle contractions more easily. Hold your hand under a table, palm up, and rest your other hand on the top of your upper arm. Push up on the table. Your biceps will bulge as it contracts. You can feel the same muscle contract, but not as dramatically, when you hang your arm by your side, then raise your forearm. 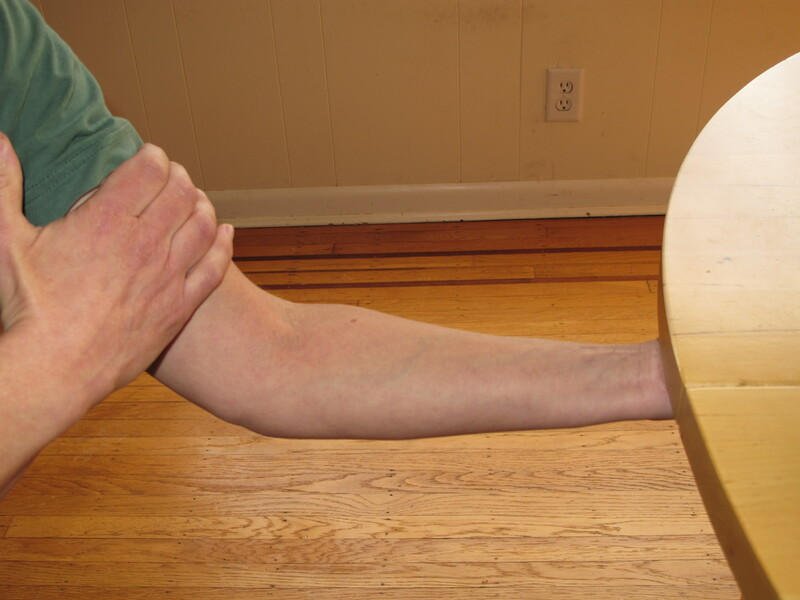 When your biceps contracts it pulls on the bones of your forearm, so bending the arm at the elbow. If you are pushing upwards or lifting a load the muscle exerts more force by contracting more (so it feels larger). Lay your arm on a table, palm down, and feel the underside of your upper arm near the armpit with your other hand. Push down on the table to feel the triceps contract. The triceps works opposite your biceps to straighten your arm. Sit on a chair and rest your hands on your upper thigh. Lift your lower leg by straightening at the knee, and you should feel your quadraceps bulging as it contracts. The hamstring on the back of your upper thigh works opposite the quadraceps to bend your leg. Stand on your toes while feeling the back of your lower leg. The gastrocnemius is connected by the Achilles tendon to the ankle. When it contracts you raise your ankle.